Now that so many people use social media – Facebook claims more than 1.5 billion users – it makes an excellent, swift, alternative means of communication. This can be useful in times of terrorist attacks, such as in Paris, during events such as the Arab Spring or elections in countries with state-controlled news outlets, or in the event of natural disasters. For example, Facebook launched its Safety Check service in October 2014, inspired by the earthquake and tsunami in Japan in 2011. Japanese engineers developed a prototype that allowed users to quickly notify their friends they were safe. The service monitors posts to infer the location of the user, and if it’s detected they are in proximity to a natural disaster the user is prompted to indicate whether he or she is safe. First used only for natural disasters, Facebook activated Safety Check during the Paris attacks. Google deployed a similar service, Person Finder, in the aftermath of the Haiti earthquake in 2010. The American Red Cross also launched Safe and Well in 2013, but Facebook’s Safety Check is easier to use – and given Facebook’s enormous popularity would reach more people. Early internet pioneers such as Howard Rheingold in his book Virtual Community (1993) made the case that this new medium could be a means to provide emotional support to one another, or to help political organisation and activism. As it happens, similar arguments were made in the 1920s with the introduction of radio. Then, radio amateurs had to stand up against government regulators who’d sought to restrict civilians from the opportunity of two-way radio communication. A point radio amateurs forcefully made at the time was the medium’s capacity to aid in disaster relief, and this was appreciated especially in the US with its decentralised infrastructure. Critics have argued that the use of new media in disaster relief is really just a red herring to disguise its otherwise superficial nature, and that companies such as Facebook want to whitewash themselves in order to rake in more money. After all, these services claim the rights to everything one uploads. Others have complained that a tool that applies flags to profile pictures to show solidarity after events such as Paris isn’t available for other notable, and arguably worse, events elsewhere in the world. There are other concerns. Facebook’s Safety Check has been misused, for example, by users not in Nepal at the time of the earthquake. Nepal earthquake – some weren’t there. Many social media services have location-based features, which when combining social and geolocation data has raised concerns about security and privacy. Such information has been used in the past to rob celebrities, such as Rebecca Adlington, for example. Facebook promises that only a user’s friends can see the Safety Check update, as an apparent precaution against malicious use of this data. But there is considerable value in what’s referred to as volunteered geographic information (VGI). Charities, aid agencies and NGOs have used VGI to build support for their work, such as the Mapping Kibera project in a deprived neighbourhood of Nairobi, Kenya. Essentially Kibera is a blank spot on commercially available maps, including Google Maps, meaning it was difficult for aid organisations to provide help effectively as so little data was available. Local activists started the Mapping Kibera project in 2009 with volunteers charting the neighbourhood and carrying out a census. In cooperation with OpenStreetMaps they were able to create a detailed map that now supports NGOs to deliver more targeted aid. 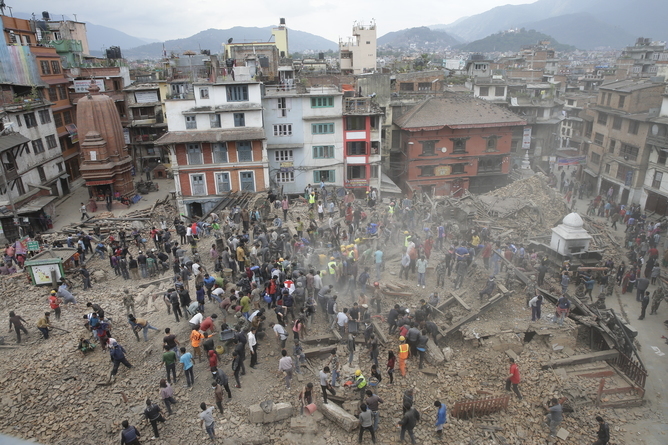 The same techniques and technologies have been used elsewhere for citizen journalism and disaster relief. In Africa, activists created the Ushahidi platform which allows the easy deployment of independent, VGI-based news services. Initially developed in 2008 to allow citizens to report violence following the Kenyan national election, it has since been used in many places that lack independent news media to provide an alternative, frontline view of current events. One of its advantages is that volunteered information can also be submitted by text message, an important method for developing countries where internet access is not always a given but cheap, simple mobile phones are common. So there is justified scepticism towards what social media platforms can achieve, but compared to others they do have the advantage of being scalable. Whether it is a multi-billion dollar corporation like Facebook or a small grass-roots project like Mapping Kibera, both can contribute to disaster relief or citizen journalism. Generating live, local data brings other benefits too. After hurricane Sandy, US authorities used social media posts such as reports, photos or location data to create a post-mortem analysis that could inform planners how to protect the area from future disasters. In this respect social media is not so different to old-fashioned media: a lot of superficial fluff, but with moments when it really shines.